Evolv, the new line of mena��s wear by the in-house designers of luxury store Evoluzione, is a collection of traditional yet contemporary pieces targeted at the well-travelled male who likes to wear a bit of the sub-continent on his sleeve. In classic masculine shades of blue with a mix of white, the garments perfectly balance class and quirk. Plus, some red, burgundy, and pink numbers which are great for the festive season ahead. Launched only very recently, wea��re told they have already sold out about 40 per cent of their stock. a�?This was just an experiment and wea��re happy to see ita��s such a success,a�? says Anu Shyamsundar, vice president of the designer store and the brains behind the brand. Bandhgalas get a contemporary look with modern touches, exclusive fabrics and interesting colours. Formal white shirts gain elements of Indian sensibility with a splash of bandhini print on silk collars and ikat patterns strategically placed. All done very tastefully, and suited to the modern Indian, fashion forward man, the line also offers a range of kurtas, tees, casual linen jackets and scarves in single count cotton, viscose and wool blends with ombre and pixelation effects and prints of abstract paintings. Also look out for details like denim elbow patches and hand-embroidered designs on formal white shirts and ribbed collars. a�?The challenge with mena��s wear is that it needs to be subtle but should have enough detailing to make the wearer stand out without being over the top. I think thata��s something we have managed to achieve making this line a great success,a�? explains Chennai-based Atul Malhotra, managing director, adding, a�?We hope to reach out to customers in the age group of 25 to 40 years who are well informed and design conscious.a�? While a majority of the material has been sourced from around the country, they have also sourced limited edition fabrics in pure linen from Japan for some of the less formal jackets. The garments have been priced very competitively while not compromising on quality, style and finish. a�?The idea was to keep the price moderate and yet create pieces that are simple, clean and sharp. 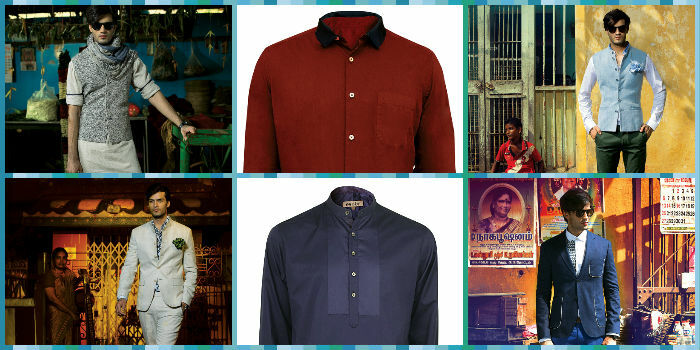 We found that men are at a loss when it comes to modern Indian wear and we hope that Evolv will be the solution,a�? Shyamsundar concludes.